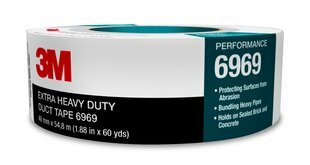 3M™ Extra Heavy Duty Duct Tape 6969 delivers industrial strength, easy tear and abrasion resistance to your job site or toolbox. It provides moisture resistant and tack-free edges to give you an easy-handling duct tape that is ready to take on tough jobs such as bundling pipes or rebar, hanging heavy containment sheets or securing trip hazards. 10.7 mil tape is tough enough for heavy bundling, joining and sealing. The aggressive rubber adhesive delivers a strong bond and clean removal. Water-resistant polyethylene backing seals out moisture and resists wear. Handles easily and tears cleanly.